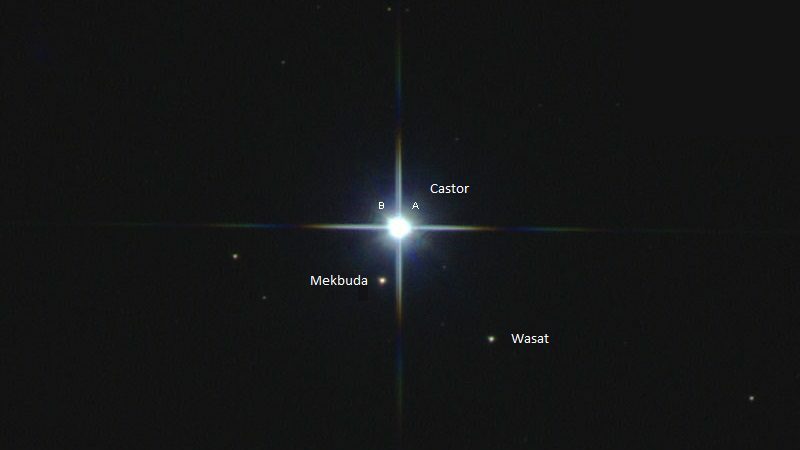 Fixed star Wasat, Delta Geminorum, is a 3.5 magnitude pale white and purple double star on the right elbow of Castor, the Northern Twin of Gemini Constellation. The tradition name Wasat comes from an Arabic word that means Middle. Pluto was discovered conjunct Wasat on 18 February 1930 by Clyde Tombaugh. Jerry Lewis was one half of the famous duo act with Dean Martin that touched the hearts of millions. When his relationships with Martin ended bitterly, the two did not speak to each other for some 20 years. George Michael was one half of WHAM!, Britain’s most successful pop duo of the ’80s. 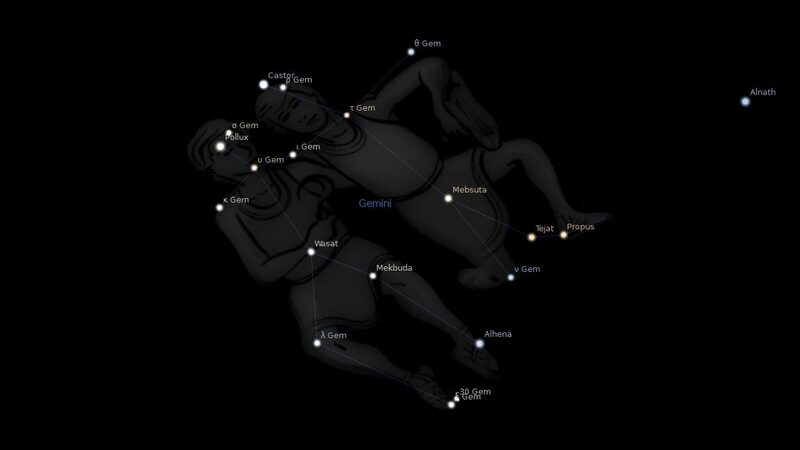 So the Gemini myth written in the stars certainly seems to manifest in real life down on here on Earth. This star which joins the twins, the “middle”, has an effect which builds bridges, forms alliances and treaties, and leads to peace more than war. There is also separation involved, as shown in the events with colonial powers moving out of occupied countries. I’ve looked at some natal charts and found some justification for these interpretations. However looking at mundane events, I have found some most interesting, and more positive associations with the story of constellation Gemini. These themes are of cooperation, bridge building, and compromise. All Mercury Venus attributes associated with close partners, whether friend or foe. Finding the “middle” ground. Pan Am’s first ever flight (Key West to Havana). Holland Tunnel opened linking New Jersey and New York city. USA pulled troops out of China. Italy and Ethiopia signed the Italo-Ethiopian Treaty. The Kellogg-Briand Pact was signed, the first ever treaty outlawing aggressive war. The USA brokered an end to the Cristero War in Mexico. Mohandas Gandhi started the passive resistance of the Salt March. The London Naval Treaty was signed by the UK, USA and Japan, limiting naval buildups. France pulled out of the Rhineland. The first European Parliament opened. Eisenhower flew to Korea to try and end the Korean War. The first successful separation of Siamese twins occurred in Cleveland. Hiroshima atomic bombing ending WWII. United nations Charter ratified by USA. British troops withdrew from Iran. Britain promised independence to India. USSR and Switzerland resumed diplomatic relationships. Jordan gained independence from Britain. The Malayan Union was formed. Singapore became a Crown Colony. The Suez Canal opened for the first time since the Six Day War. The UK voted yes in a referendum to stay in the European Community. The African, Caribbean and Pacific Group of States (ACP) was created. Egypt declared full independence from Britain. The Old Bridge of Mostar was reconstructed after being destroyed in the 1993 war. 100,000 Israeli’s formed a 90 km human chain from Gush Katif to the Western Wall to protest disengagement plans. Barack Obama delivered his keynote speech at the Democrat convention. 1. Fixed Stars and Constellations in Astrology, Vivian E. Robson, 1923, p.46, 216. 2. Fixed Stars and Judicial Astrology, George Noonan, 1990, p.39. 3. The Living Stars, Dr. Eric Morse, 1988, p.45. 4. The Fixed Star Health and Behavior Imbalance, Ted George and Barbara Parker, 1985, p.49. I would like to hear about when Wasat is conjunct benefics like Venus and Jupiter. Can they turn around the saturian effects? Would definitely bring about the “Partnership & Compromise” side of this star. I feel this star was not pretty for me yesterday. Though, I did the best I could, I felt the whole night and during the day a not pretty feeling of the swirling winds and found it hard to stay grounded and connected. I decided to be more than prudent with all the situations around me and I feel deeply grateful when I feel the tiny stars in certain parts of my body, when the dark episodes go by. Today, at peace (what am I going to do with somany hours…?). What are the odds, and how cool is this!!!!?? I have a twin brother and our charts are one degree apart on houses and all the planets are the same degree (5 minutes apart) So our Midheaven is at 18* and 19* Gemini (the twins) our Saturn is in this house at 18* Cancer! Wasat is 18* Cancer designated within the Twins. Ok so how cool is that, right! I don’t much about fixed stars.. but if anyone has a lead on this one I will be looking into it! I have Saturn conjunct Wasat, and that description is dead wrong. I’m very close to my parents, especially my mother. Great feedback thank you Kate. Yes, same as Kate in the disagreement, though with my Mars conjunct Wasat. Very close to parents, still having to live with them. I do throw fits and slam doors, but never hit anyone. I know you don’t deal with mutual receptions, but my Mars in Cancer is MR with my Moon in Aries (and both are involved in t-square with Pluto); so, I am motherly although no children, and I don’t mind being mothered/supported. Not married so I don’t know how I’d treat a husband. I do know he would need to be a strong understanding man!